As you may know, on March 15, 2005, GSA initiated the Section 106 consultation process, under the National Historic Preservation Act, regarding the current setting of the historic murals in the headquarters Ariel Rios North and South buildings. GSA established a consulting group and developed a Web site to solicit comments from interested parties: www.gsa.gov/arielriosmurals. An executive summary of these comments is now posted on the Web site. 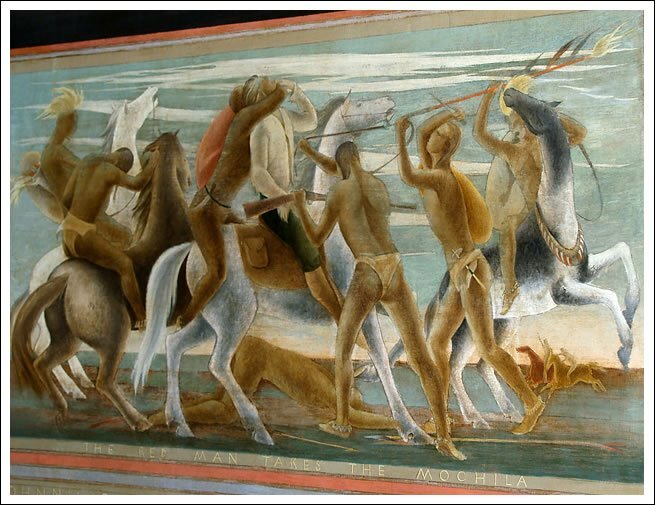 The next steps of this process include GSA identifying a panel of experts that will meet in mid-October to provide them with a higher level of information and input on the murals. EPA employees, members of the Native American community and other interested parties will be invited to participate. At the completion of the forum, the recorded dialogue will be made available to the general public and a final round of public comments will be taken. Based on the information derived by the forum and the public comments, GSA is expected to make its final determination regarding the murals by January 31, 2007. In the meantime, GSA has completed the design of a temporary screen that will be placed in front of the murals on the 5th floor of the Ariel Rios building. The screen is expected to be ready for installation no later than July 21, 2006. This will be the subject of a rant from me later on... below is "The Red Man Takes the Mochila."